How Argentine Park got its name? Does anyone know how Argentine Park in sector G6 of Islamabad got its name, asked the Argentinian Ambassador rhetorically? He paused for dramatic effect and looked at the bevy of intellectuals, academics, think tankers, former diplomats, journalists and at least one businessman and senator, including some very old inhabitants of the capital city listening to him didn’t have a clue. Mr. Rodolfo J. Martin-Saravia, the Ambassador of Argentine and the dean of the diplomatic corps in Islamabad was explaining to the assembled gathering the problem that his country was facing with the UK in resolving the problem over the Malvinas (Falkland Islands). He had spoken eloquently for nearly two hours about how the British had recognized the independence of Argentine including the disputed islands in the nineteenth century and then had forcibly occupied it in 1833. Britain was at that time a superpower and it armadas ruled the waves. Argentine could possibly do nothing against imperial Britain’s military might. In 1982, Argentine under Gen Galtieri had tried to unsuccessfully to reclaim the islands militarily; grossly underestimating Margret Thatcher’s potential to launch an expeditionary force to thwart the Argentinian efforts. They had also not reckoned with the American support to their NATO ally in form of refueling facilities en route and satellite imageries to plan and execute a very long distance operation. The British had since then held a plebiscite in the islands and have perpetuated their rule on the basis of the vote that they got. The result of the plebiscite was a foregone conclusion because all the 3000 odd islanders are of British origin. Comparing the situation with Kashmir, the Ambassador explained that both Pakistan and Argentine were faced with a similar dilemma. They were both faced with a militarily strong nation that was forcibly occupying a territory that was not theirs and not willing to negotiate at all to settle the central issues that was the central issue in the foreign policy of both countries. In case of Kashmir, the Indians were unwilling to allow the people to exercise their right of self-determination, while in case of Malvinas; a sham plebiscite was held against the principles of geographical nearness, historical context and existing UN resolutions. The British were guilty of holding on to 14 territories out of 19 registered as colonies in the twentieth century. Its greed was great. It had violated the agreement with Argentine to give off shore oil and gas exploration rights to companies by dealing with them directly, their nuclear submarines were patrolling the area regularly in the area that was a Nuclear Weapons Free Zone and had ulterior motives i.e. use the islands as a jump of point to carve out territory in the Antarctic. British global ambitions are reflected in their military expenditure that is 2.2 per cent of its GDP as compared with 0.7 per cent in case of Argentine. His presentation over, the Ambassador was holding court over lunch. The mood was relaxed and the conversation leisurely but the Ambassador was still working like a true diplomat to build his country’s case from angles. Quite naturally he wanted to strike the sympathetic cord with the thinking minds of his host country. 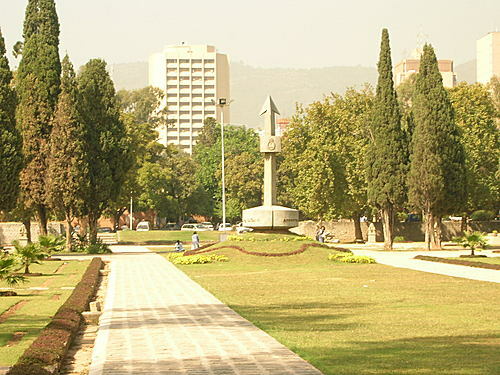 Argentina Park he explained was donated by the government of Pakistan led by President Zulfikar Ali Bhutto on the 25th May 1973. It is the only park in Pakistan that has the name of a foreign country. It was a token of recognition for the support of the Government of Argentine during the 1971 War in the United Nations Security Council and the General Assembly. Argentina had supported the resolution calling for an immediate cease-fire; the return of the troops that had invaded East Pakistan and the return of the prisoners of war and refugees. The resolution passed with the efforts of the Argentine Mission in the UN was instrumental in stopping a bloody war that could have had much more serious consequences. Argentine’s support to Pakistan hasn’t stopped there. Since it became the head of the Nuclear Suppliers Group (NSG) in 2014 for a two year term it has insisted that India resolve its issues with the neighbouring countries before it becomes member of the exclusive club. In 2014, India pressed its case for membership in the Buenos Aires Plenary Meeting of the NSG, in the belief that it had enough international support behind it but the NSG remained unmoved. In fact the Buenos Aires meeting imposed a new condition on India, calling upon it to take a leading role in halting the spread of nuclear weapons, and more specifically, demonstrate serious efforts of working towards nuclear restraint measures and open negotiations with Pakistan and China to end the regional nuclear arms race in the region. The 2015 NSG Plenary held in Bariloche, Argentina, in June this year, did not change the position that had been taken in Buenos Aires last year. Pakistan has reciprocated by supporting Argentine in the peaceful settlement of the Malvinas at the UN General Assembly. The Ambassador has recently been awarded Hilal-i-Pakistan by the government of Pakistan in recognition of his efforts to provide funds for a 1000 bed hospital in Polyclinic. The CDA despite his best efforts have yet not started work on it. Pakistan needs more friends like Rodolfo J. Martin-Saravia. It is quite common in many countries to name roads, buildings, parks, airports and educational institutions after public figures. It is not unusual in our country to rename the roads after a particular public figure falls for grace. Those in the business of giving new names try to select politically correct ones and not repeat their past mistakes. There is no guarantee that they are right the second time over. I don’t think the public cares any way. The Peshawar airport has been named after Bacha Khan and there has been no opposition at all. At one time Ghaffar Khan wasn’t kosher, he had sided with Gandhi and hadn’t espoused Pakistan’s cause. Now that a lot of water has flown down the kabul River and that the common people have forgotten about his political ideology, he not only has the airport in Peshawar but also a public square in Quetta dedicated to his memory. There is also one road in Islamabad celebrating the troublesome Faqir of Ippi, who had fought the Pakistan Army in Wazirisitan not long after the independence. At one time Shahinshah of Iran Raza Shah Pahalvi and his consort Farah Deeba were very popular in Pakistan. During those halcyon days when Pakistanis prided themselves for their close relations with the ruling Iranian monarchy, they named a number of roads after the king and his beautiful queen. After the Iranian revolution and the fall of the Pahalvi dynasty, these names were hastily changed because the government did not want to annoy the ayatollahs. So Murree Road, the main artery connecting Rawalpindi to Islamabad reverted to its old name. It still commonly goes by the same name but I won’t be surprised if the official name is different. Surprisingly Lahore’s famous cricketing venue still clings on to the name of the former Libyan strongman Gadhaffi – sadly no more because he was lynched by his own countrymen. Chaklala international airport holds on to the name of Benazir Bhutto even though PPP is no longer in power and the new airport near Fatehjang is still referred to as the New Benazir Airport. Although one would ardently wish that it becomes operational soon than merely remain new and unused. I personally think that there is nothing in a name. If a utility is delivering optimally, whether it is called Rawalpindi General Hospital or Shaheed Benazir Bhutto Hospital it really doesn’t matter. If the entire system is broken down and the poor patients aren’t getting the services they deserve, it doesn’t really serve the memory of Benazir Bhutto well. I also don’t know if her heirs are playing a role in running the hospital that certainly needs a lot of help to achieve the status it deserves as the leading hospital of Rawalpindi. It seems they are merely content with the name that the hospital accidentally got when a mortally wounded Benazir was rushed there after an assassin shot her after the political rally at nearby Liaquat Park – incidentally named after the first Prime Minister, who was the first political figure to be assassinated there in 1951. Unfortunately the hospital did not have a trained pathologist to conduct a post-mortem to determine the cause of death of Pakistan first female prime minister, a formality that the widower wisely chose to ignore. I had long believed that among other things, libraries are urgently needed in our country. Only 10 per cent of our schools have libraries and the ones that exist have certainly seen better times. I have personally sent library books to places as far off as schools in Naltar, Gilgit, Fairy Meadows, Shandur and Machch in Balochistan but I really don’t know if the teachers there encourage their children to read these books or not. It is my personal dream to take donkey loads of books during a summer break and move along the valleys in Kashmir and read the books to children along the trail and donate some of these as I move on. Recently, someone that we know promised to donate a library for our charity school to honor the attorney, who had successfully fought and won his case and got him out of prison. He had spent much of his incarceration in solitary confinement in maximum security prisons. None of us believed in his cause nor were proud of what he he had allegedly done but we did appreciate his sentiment to say thank you to his benefactor in a meaningful way that benefited children studying in our school. Naturally my wife and I were very excited. A lot of effort went into the entire project. Painting the room, decorating it, equipping it with books during the hot month of Ramzan was difficult but a very thrilling experience. All of us were quite pleased to see the library becoming a reality around Eid time. For us it was like a miracle. Before the inauguration we received a plaque from the donor bearing the name of the attorney and stating that the dedication was made by her former client. We didn’t see anything wrong in installing the plaque, more so because we had to pay Rs 11,000 in custom duty. To our utter dismay we soon realized that some relatives living abroad weren’t happy. They thought it politically incorrect and naïve on our part. Since those, who were objecting were among the donors they thought that they should have been consulted before installing the offending plaques. There is no such policy and honestly we carry out a lot of activities in the school without seeking anyone’s permission e.g. my daughter and a friend of hers organized a puppets for peace program from a funding they got from Colombia University and we are about to get a container from Germany with school furniture. I have been making the rounds of the Income Tax office to get custom exemption but to no avail but that is another story. Any way the calls to remove the plaques became so incessant that I got the impression that I was being harassed. To cut a long story short I had to personally remove the plaques, particularly after a really sharp explanation call. The caller did not want to be identified with a lost cause. He was worried, rightly or wrongly that it would cause him harm in his adopted homeland. I thought the demand was patently unfair and smacked of paranoia but my explanations fell on deaf ears. I know Sir Syed had danced to raise funds and accepted money from prostitutes to build the famous Aligarh University, so in my opinion there was no harm in accepting money for a library from a person who had served time. I gave in at the end because I didn’t want anyone to be harmed. Whatever we have done so far has been out of a sense of obligation. We do not ask for money but when someone donates we keep a record of it and are very careful of how to spend it. There are regular audits. A lot of our time, money and effort go into something we believe in. In a small and modest way we are paying back to the society that has given so much to us. The government doesn’t help and we only end up annoying people. What are the options before us? Step back, as advised and have a fresh look at our strategy and policy or keep on doing irrespective of the consequences including the annoyance of donors and the possibility of reduced donations. I am certainly having a re-look at things but I hope there will be ways to keep on doing what we think is good for our country.